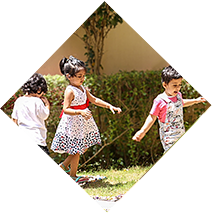 Balanced activities and experiences are planned to enable each child to enjoy learning and better her best. 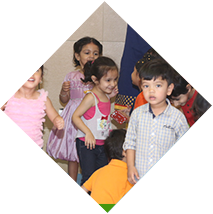 Children learn through fun filled activities. The equipment and materials are easy to handle and accessible to the children. Children learn to engage effectively with others by listening and being listened to, articulating thoughts and ideas, widening one’s vocabulary, role-play, pre-reading and pre-writing skills. Children develop early numeracy and critical thinking by sequencing, recognizing size, shapes, quantities, contrast, reasoning and other pre-math skills. The focus is on the child and the aim is to enable her to develop at her own pace. 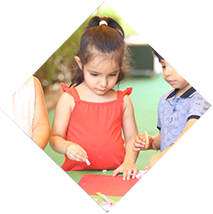 Children engage in activities related to developing values and skills that make them responsible and sensitive. 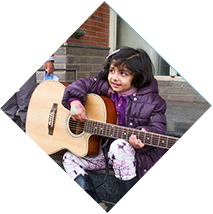 Learning happens through play by linking concepts with art, music, dance, drama and physical activity. Emphasis is on a balance between indoor and outdoor activities. Children learn to respect and care for the environment and attention to a healthy and active body. 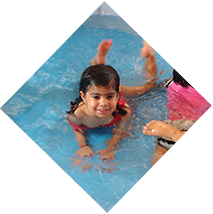 Children are encouraged to work compassionately with children of different abilities, cultures and communities.